Engineering is continuing its upward shift through technological advancement, scientific findings, and computing expertise, guaranteeing engineers continual employment and keeping the market competitive for employers looking to hire top talent. 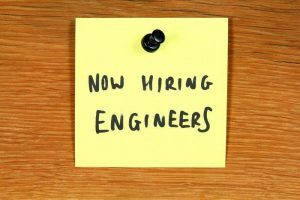 This high demand for engineers is forcing companies to work hard to establish specific hiring goals in order to find their “perfect match” for a competitive wage. Know the market – The most difficult engineers to hire are those with about 10 years of experience. They are established in their firms, have stability, and usually a level of compensation that suits the stage of their career. You may consider fresh out of school graduates, engineers looking to change their area of speciality or new immigrants. Although these candidates will have a longer learning curve, they can often contribute at a high level for a lower starting salary. Compensation – The dollars increase when the competition grows. Because engineers are in high demand, competitive compensation is a requirement. Know what your peers are offering at other firms. Think of it as an investment in your company’s future. We have seen firms take years to fill a position as a result of unrealistic compensations and the belief that their company is so special that an in-demand engineer will forego substantial cash compensation to work there. This very rarely happens and even if they eventually fill the position at a lower than market salary, the questions of “What was the cost of the position being vacant for a year or more?” and “How long will the individual stay if they are being paid less than market?”, need to be asked. It is not necessary to overpay; however, salary needs to be in a competitive range – combined with a healthy work environment, interesting projects, and a comprehensive benefit program. Speed – The recruitment process will reflect on how your company works. Moving diligently through the hiring process, securing the interviews and offers without unwarranted delay (should the candidate arrive at this stage) telegraphs to the recruit that your company means business and knows how to execute a decision in a timely fashion. It also allows your company to make decisions on candidates while they are still available. If you decide not to move forward with a candidate, that is fine. However, if you take too much time to review a candidate and decide to hire a week after they have accepted a position with a competing firm, you will find yourself starting back at square one. Fit to the person – In the old days, companies would expect new employees to conform and bend to the needs of the company at all costs. Today, a more effective approach is seeing what a recruit can bring to you. Hiring the right person when you find them, may require creative thinking. It sometimes works to change or expand the job in order to better fit the recruit so they can thrive in your company, bring more value, and fulfill the responsibilities originally being hired for. We have often seen companies hire a great candidate for a new position which was created for that individual because of the skills and abilities they saw in the person. Often this is done to fill a future need early, knowing how difficult it can be to recruit certain skills. Employee referrals – Because there is such a high demand and increased competition to recruit engineers, it doesn’t hurt to look internally to see who at your company may know others who may want to help out. This solves two problems: it helps cast a wider net than your own network and it provides a list of people that have been “vetted” before the interview process. As recruits know they are high in demand, they will leverage their skillset to earn a higher wage and receive the benefits they prefer. Make sure you have a proper system in place that shows respect to the candidate and provides the right information for them to make an informed decision. Don’t give them a reason to dismiss your organization with an unorganized and unappealing first impression.